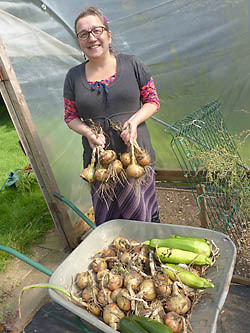 How do you see success in your garden? 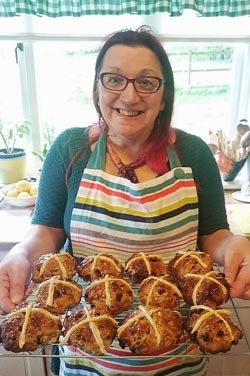 Are you like me expecting that you can achieve what you might consider great things as well as working and looking after you family and your house?! I continually have to put this success into perspective. There is only so much time you can put into growing things unless you are putting all of your time into being self sufficient (so my husband keeps telling me)! I’ve just been out to explore the garden that gets attended way less than I’d like, to pick some things for lunch and this is some of what I saw. Here’s a long awaited update from the green house. These are red sweet peppers from bought seed. I don’t want to speak too soon but I think they are doing alright. These are chilli peppers I got free from a magazine. ‘Demon Red’ There were only five seeds and I have three healthy plants from them. By the sound of their name, they are gonna be hot! 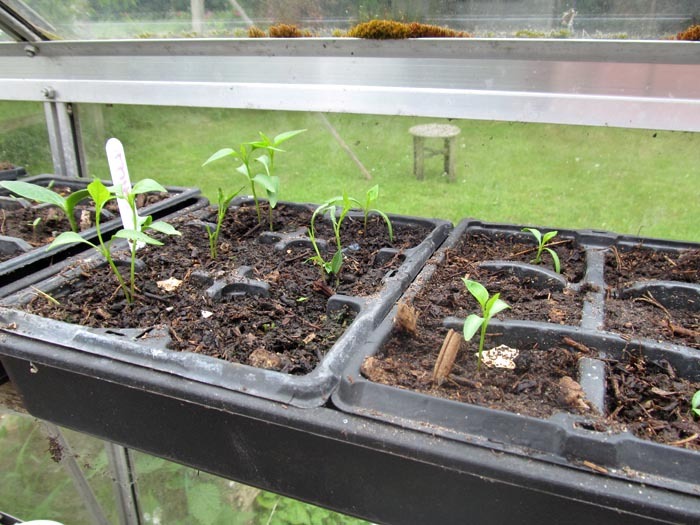 These are common red chillies, medium heat, from my own saved seed. I dried some of these before and they keep well. 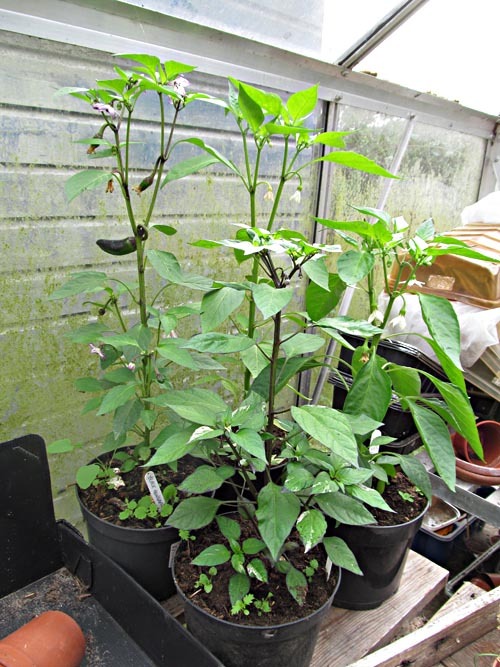 I am really pleased to report that my 5op chilli plants that I bought in the summer are now looking like this. 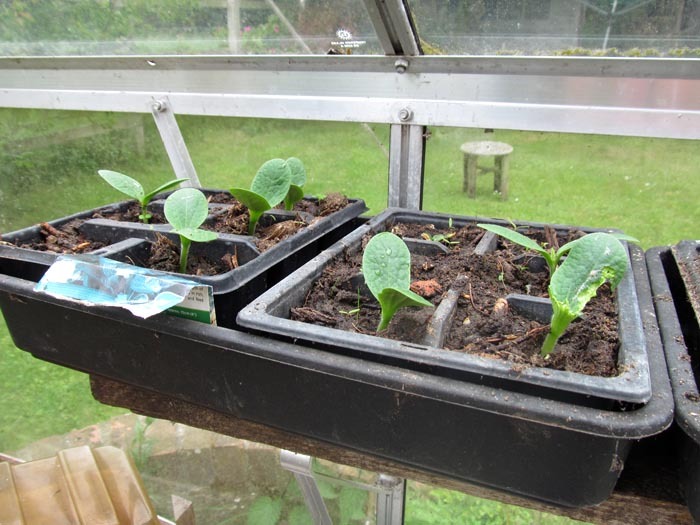 As I hadn’t time to prepare the beds when the plants were ready my squashes and courgettes went into a wheel barrow and some large pots. They are looking like this. 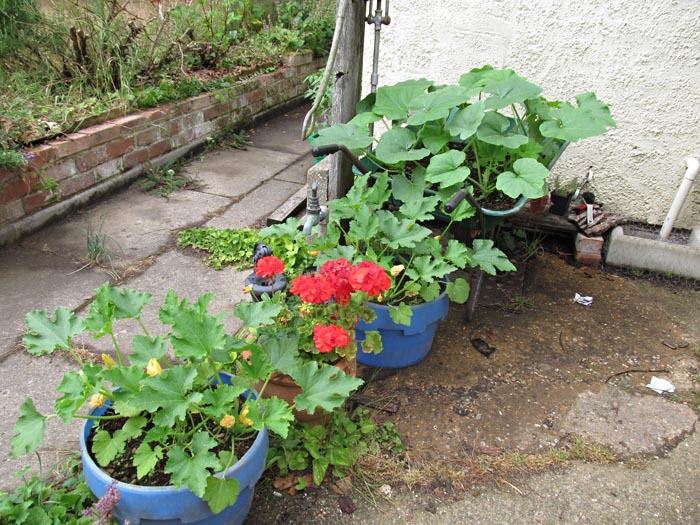 These are at an advantage being by the back door, watering is easy. I’m looking forward to the fruit now that I have got all those flowers 🙂 By the way, these are all growing in my home made compost! 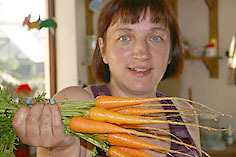 Well, here in Norfolk in the UK, the weather has been very gloomy and dull and the plants and vegetables are reluctant to grow. I’ll show you the bright bits first. 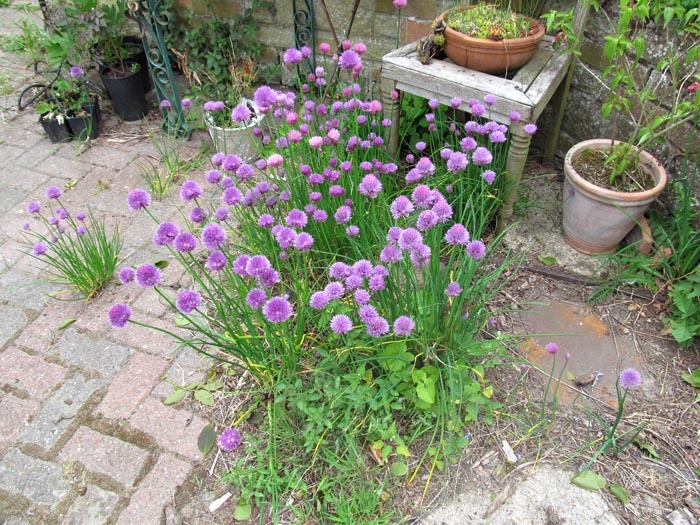 The chive flowers always are a treat. 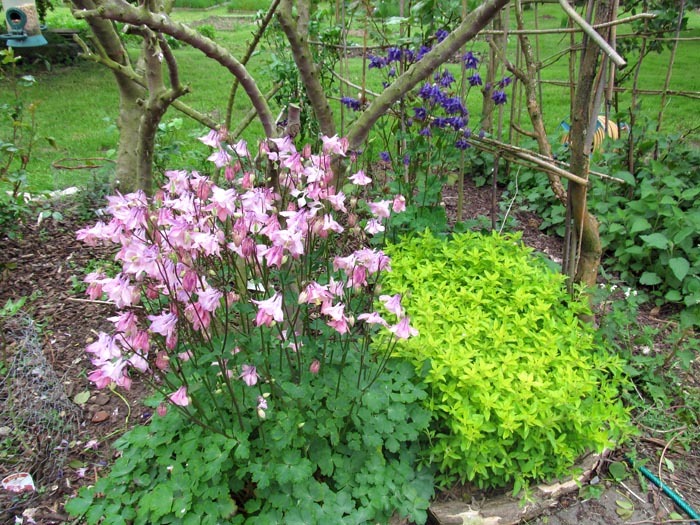 The Aquilegia are one of my favourites as they flower for quite a long time. 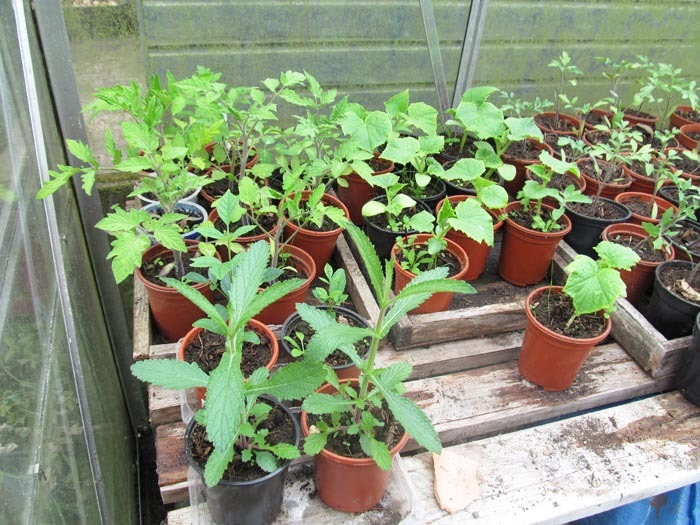 The greenhouse is very slow this year, any taste of warmth though and the plants put on a spurt of growth. 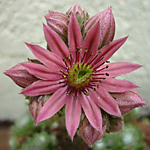 Life for plants is very hard and frustrating for humans.